Anyway I can't seem to figure out what would help my Ultra's the best? I keep having very very mediocre results with my Sicaran tank from back in the day. (It's still largely unpainted). I have the accelerator variant with two last sponsons. I also have the Fire Raptor but since the points got jacked, and Flyers got nerfed for table presence, I really don't use it. Overall I'm not terribly fond of vehicles in my Ultra's because not many of the strats work, nor the Chapter Tactics (I'm confident it will change in December but still). So back to Forgeworld all I can think of is a dreadnought. The most popular that I see out there is the Leviathan with dual Butcher cannons Or a Deredeo? What would be your choice given the circumstances? I have used it a LOT. No movement penalty, very fast, great firepower with a nice bonus against vehicles it damages. The Scorpius is decent also but it needs a character to sit with it for re rolls, imo. It has performed well when I've run it but never quite as impressive as the rules look on paper for some reason. I have a feeling Leviathans will get a point drop, and am aware the Lucius Pod is coming back, but as if right now they are too pricey. Edited by Ishagu, 08 November 2018 - 09:43 PM. Leviathan with dual Grav Flux Bombard. It literally kills everything. You can kill a heavy vehicle a turn with 2D3 shots that do 5 damage a piece! Even Knights will wilt under that! And against infantry it rocks! Most targets will be 5 models or more and it will do an EXTRA D3 shots per 5 per gun! So: - against say 5 Primaris it'll fire 4D3 shots. - against 10 Guardsmen it would 6D3 shots. - against 30 Orks or Chaos Cultists it'll 14D3 shots! That's an average 28 shots hitting on 2s and wounding on 2s! Very Ultramarine in that it can perform against everything. A Deredeo with Plasma Cannonade looks effective too though it's quite specific. Edited by Captain Idaho, 08 November 2018 - 10:33 PM. Deredeo, I'm sad to say, is just OK. I do really, really like the Leviathan but it's so Damn expensive. I think Chapter Approved might give us some new strats or deployment options that might make it better. What about three Quad Mortars? Okay is good enough for me. I don't play 40K just with the good stuff. I do think the Deredeo is a tad expensive but that's only because Marines don't have the target saturation targets to put off people wiping it out etc. If other stuff get improved/points drops then the points spent on a Deredeo aren't so heavy. They're so so. I've run them a few times but they aren't anywhere near as durable as they were in 7th. I wonder if the Leviathan arms are easy to magnetize... anyone try it? One other item I've looked at, but haven't tried is the Xiphon interceptor. Or even 2? Anyone try those? Yep, they're decent. I'd say they are the best Astartes dedicated anti armour flyer. They were really good before the point hike. Hopefully they'll drop again! The Leviathan weapons are very straight forward to magnetise. The arms are pretty similar to those on a Contemptor but even easier because they're bigger. This picture doesn't actually show the magnets, but they're where the black shoulder plate meets the blue housing of the weapon arm, just above the large joint. I usually take Scorpius or Leviathan depending on what I am facing but preferably both! Bloody hell...I haven't looked into the grav flux weapons before, just wow. Awfully tempted to make that my next purchase! Fluff: Naval Operations of Ultramar. Also includes all known named ships for all chapters, as well as ship sizes and assorted information. Personal: The Renegade Hobbyist. This is where I do things! Also, follow me on Twitter at @Atomic_Hamsters. "I miss using Sly Marbo. I like to think he is still somewhere in the codex, but no one can find the page." I should warn players that they are short range and on a slow platform. Chaos with Warp Time get a LOT more mileage out of them. A loyalist Leviathan is on danger of never firing a shot. Actually this is why I favour the Dreadnoughts... I can Deep Strike them with my Deathwatch. But still a good point and why I still lean to butchers. you mean storm cannon array, we are loyalists! I personally think both double storm cannon array and double grav flux bombard are great. The grav flux will probably get better with orks shaking up the meta. They are very, very easy to magnetise. Edited by Joukernaut, 10 November 2018 - 08:52 PM. Again, vouching for ease of Leviathan magnetization. I'm leaning towards the Leviathan but I have to admit I still think it works better in my Deathwatch. I am really struggling with my Ultra's. Their identity on the table is just weird to me, but that's a different topic. I will probably end up with trying to magnetize arms. My friend is at Forgeworld next week I believe so still a few days to think about it. 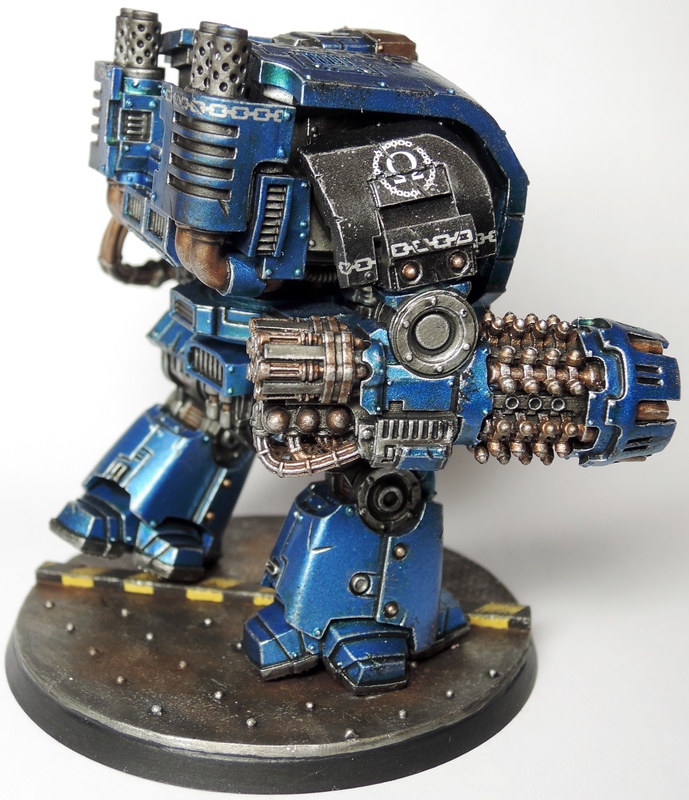 Could paint a Leviathan up as an Ultramarine back from a DW tour. So blue with an iconic silver shoulder, or remains DW black and keeps the other shoulder Ultra flavored. Then you could use it in either army. Yea but I don’t have Morticon money. Lol. I gotta be pretty certain about this. I still don’t think there’s a much better unit, especially in the Dread category so I’ll probably go for it. Sicaran Venator - Its a fluffly choice as Guilliman helped to design it back in the day, it will be like taking an Old Robin Reliant out for a spin next to your shiny new Repulsor. If you want killing power, I'd go for the Leviathan. Grav Flux Bombad and Seige Drill. I'd love to see one go up against Morty or a Knight. I prefer the Melta to the grav but it costs more. I'm hoping CA reduces the Leviathan significantly! At the moment I really do stand by the Venator as the best FW unit for the Ultras. Edited by Ishagu, 19 November 2018 - 03:16 PM.